After opening Thursday at the Sercotel Sorolla Palace Hotel in Valencia, Spain, the 10th anniversary edition of the Domaining Europe conference (that transitioned to its new NamesCon Europe name this week) continued with another full business day Friday (June 8, 2018) and closed today, Saturday, June 9, with a Tour of Valencia. We ended our Day 1 post Thursday by noting that attendees were on their way to a gala evening dinner at the Marina Beach Club in Valencia. NamesCon has since posted some photos from that event (the photos in this article are all from NamesCon’s Twitter feed or Facebook posts unless noted otherwise). Below: SmartSites.com Co-Founder and CEO Alex Melen followed with The 3 B’s of Developing Domains: Buy, Build, Benefit. This session provided advice on how to develop your domain to create recurring revenue while also increasing the domain value. 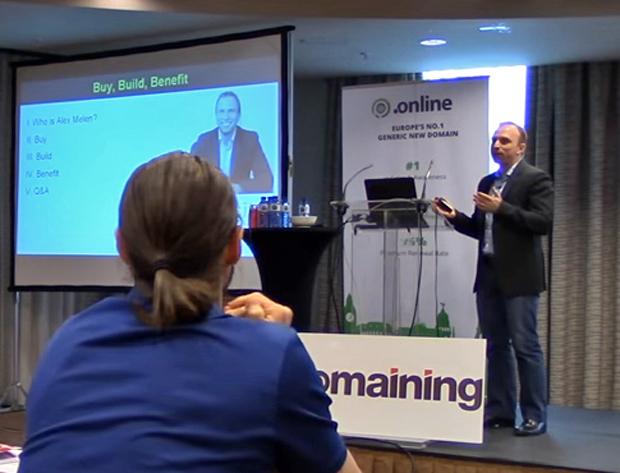 Melen also covered domain development, SEO, PPC, SMM and ran through a real-life example of the revenue and value-creating potential of developing your domains. The photo is a screenshot from a YouTube video of Alex’s talk. For more pictures of the event please visit the original source.